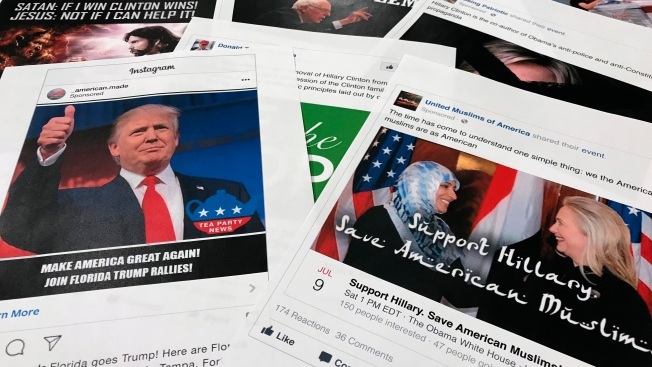 Some of the Facebook and Instagram ads linked to a Russian effort to disrupt the American political process and stir up tensions around divisive social issues, released by members of the U.S. House Intelligence committee, are photographed in Washington, Nov. 1, 2017. Facebook says it will show users if they followed or 'liked' Russia propaganda accounts on its service or on Instagram. The company said Wednesday it will launch a portal to let people see which accounts of the Internet Research Agency they followed between January 2015 and August 2017. The tool will be available by the end of the year. But it won't show users if they merely saw — or even "liked" — individual posts from those pages. Rep. Adam Schiff, a California Democrat, called the move a "very positive step" in a statement. But emphasized that he's still looking for more, including a joint report by the companies "on how Russia used these platforms to sow discord and influence the election." The companies were initially dismissive of Russia's threat, but they all pledged to make improvements amid pressure from lawmakers. Still, Facebook so far hasn't said it will show people if they were targeted by Russia-paid political advertisements, or even if this is something it is able to do.